Employee screening is a key element to a good and lasting hire. A thorough background check helps to ensure that a company adds the right person...a person who will be a productive member of your team and have a positive impact on achieving company goals. A good background screening process helps employers avoid costly hiring errors that can endanger the bottom line and even worse, employees' physical safety. The same holds true for temporary staff. It is equally important to make sure that a temporary employee will have a positive impact on an organization - just like their permanent counterparts - which is why it is important to understand a staffing agency's role, process, and responsibilities in employee screening. 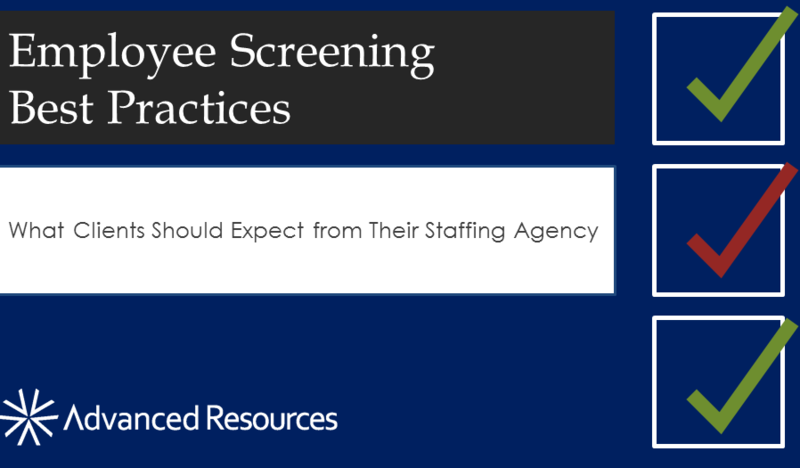 Download Advanced Resources' exclusive "Employee Screen Best Practices" executive brief here. Employee screening is critical. Be sure to find a staffing agency partner that understands their responsitibility in ensuring your safety and success. Advanced Resources is Chicagoland's choice for top finance & accounting, tech, helathcare, HR, and office support talent. Find out more at www.advancedresources.com.